One of my resolutions for 2013 is to take the Project 365 challenge where you shoot and share (at least) one photo a day for an entire year. This should give me a chance to continue developing my photography skills and will be a great way to document the daily happenings of my life. Since shooting, editing, and posting every day could get rather time consuming and interruptive – I will likely be posting a lot of my photos in sets over the weekends. Day 1’s photo is a partial self-portrait. The focus, at least my intended focus, is on the mug and then the tattoo. The mug because I have a seriously lame head cold and have been downing tea all day. The tattoo because today is January 1, and above all, my top resolution for the year is to live. As for the editing of the image, I went with desaturation to represent the fuzziness of a cold and the coldness of this Michigan winter day. 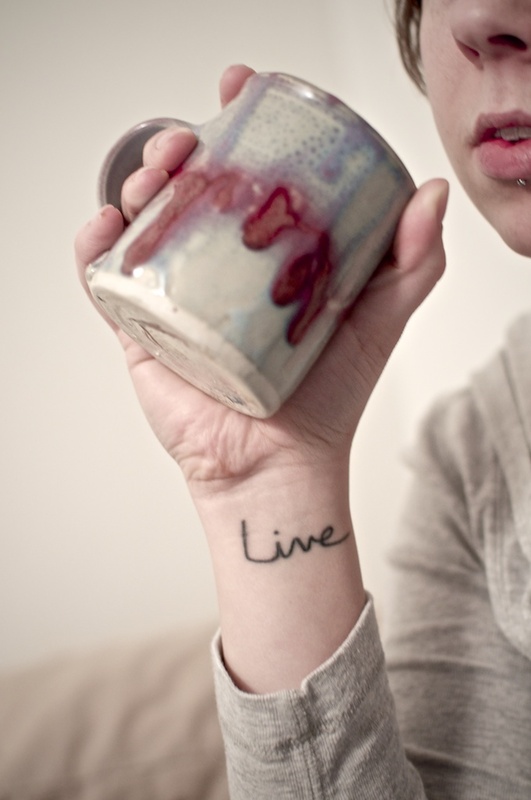 Posted January 1, 2013 at 11:40 pm in Photography, Project 365 and tagged 2013, ink, live, mug, Project 365, tattoo, tea, wrist. Comments RSS. Post a comment.